Qantas partner China Eastern will once again bring its flagship Boeing 777-300ER aircraft onto flights from Sydney and Melbourne to Shanghai this summer, complete with the airline's latest-generation business class seats and a first class cabin as well, not normally seen on the airline’s Australian flights. Aboard the Boeing 777s, six first class suites take pride of place at the front, all of which feature closing doors for added privacy and can transform from your office in the sky into a fully-flat bed of 79 inches (200cm). Four of those suites line the windows, while the centre pair, labelled as 2D and 2H, can be separated for solo flyers or opened up and transformed into a full double bed for high-flying couples, in a move that reminds us of Singapore Airlines Suites Class. First class also features a walk-up bar for any sneaky mid-flight drinks and snacks, although we’re sure the crew will happily serve them direct to your suite. Business class also comes with fully-flat beds, with 52 seats laying out to 75 inches (190cm) in a 1-2-1 arrangement, guaranteeing every passenger direct aisle access. Frequent travellers might recognise these seats as being crafted from the popular Zodiac Cirrus design – also used on Australian flights by American Airlines, Cathay Pacific, Vietnam Airlines and more – albeit with each airline customising the seat's look, feel and shape to match their branding and colour palate. Which flights get China Eastern’s Boeing 777s? With two daily flights in each direction between Sydney and Shanghai throughout the summer peak, passengers aboard flight MU736 from Sydney and MU735 from Shanghai can take the Boeing 777 on Mondays, Tuesdays, Thursdays and Saturdays from December 9 2017 until March 10 2018 (inclusive). On the other days of the week during this period, and after mid-March next year, the usual Airbus A330s will ferry passengers along the route, topping out at business class. Victorian travellers will find the Boeing 777s taking wing during a similar window, serving on flight MU740 from Melbourne and MU739 from Shanghai on Mondays, Wednesdays, Fridays and Sundays from December 8 2017 until March 9 2018. As with Sydney, all other flights between Melbourne and Shanghai will continue to run with China Eastern's standard Airbus A330 jets. Subject to availability, Qantas Frequent Flyer members can also book China Eastern flights from Sydney or Melbourne to Shanghai for 114,000 Qantas Points in first class or 78,000 Qantas Points in business class, one way, plus applicable taxes and charges. However, these reward flights can only be booked by calling the Qantas Frequent Flyer team on 13 11 31 between 7am and 7pm Monday-Saturday (excluding public holidays) and pressing 1 for ‘travel arrangements, including Classic Flight Rewards’, rather than being offered via the Qantas website. 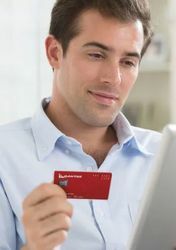 On paid fares, Qantas members can instead earn frequent flyer points whenever travelling on a China Eastern MU flight number, plus status credits if booking the flight as a Qantas (QF) codeshare. What's the best way to find MU first class award availability? Clearly Delta isn't great as they don't allow first class. Just thought I'd ask as calling can sometimes take over an hour waiting. Would be much easier if we know which dates have award space and how many are available. 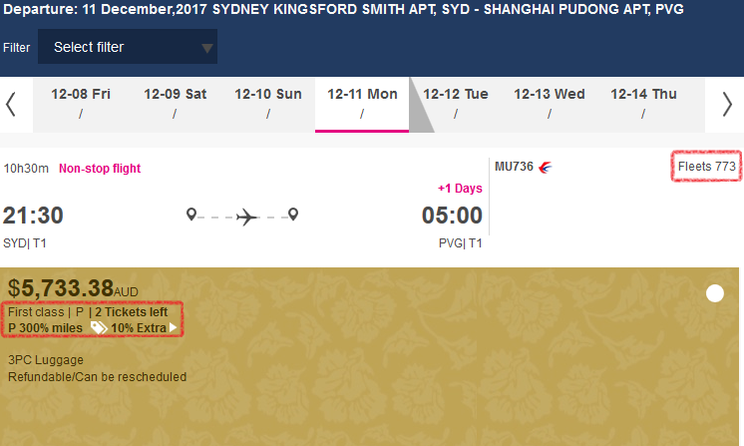 You can search on ExpertFlyer for an indication via the Awards & Upgrades tab (plug in China Eastern MU, and then 'A' for first class or 'O' for business class), but note that this usually searches the availability shown to China Eastern's own members, so it's not guaranteed that if you find availability this way that Qantas Frequent Flyer members will also have access (but you're in with a pretty good chance!). why does qantas partner with airlines that make them look below average ?! China Eastern's flagship business and first look amazing compared to QF A380 product. You can't compare one airline's oldest and worst hard product to another airline's newest and best hard product. Almost 100% of the time if you did this comparison with any two airline, it would have the same result as you have concluded above. Great to hear. Much prefer the MU 777 to QF (via SYD) A330 from MEL. Any pre-conceived ideas one has about Chinese airlines will be blow away by this product, save for the lack of a real wine list in J. So now even China Eastern is miles ahead of QF..........I currently fly CX but this is worth trying. And don't forget the chain smoking pilots! Is this business class only on the 777-300? 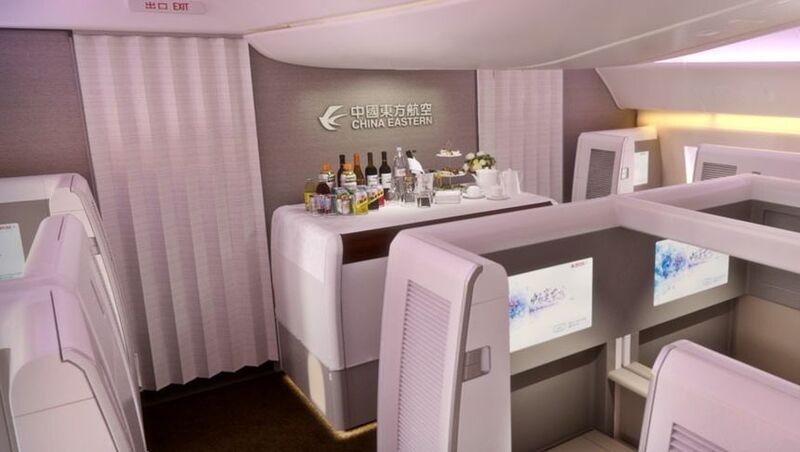 Comment on "China Eastern plans first class, Boeing 777 for Sydney, Melbourne"